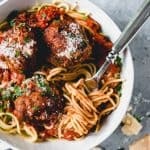 Made with both ground beef and ground pork, with Italian herbs, Parmesan cheese, and a flavorful, easy, homemade spaghetti sauce, this is the best spaghetti and meatballs recipe ever and it is classic Italian-American comfort food at it's best. Soak bread in water then squeeze out as much liquid as possible and tear bread apart. Add bread to a large bowl with the ground beef, ground pork, eggs, bread crumbs, Parmesan, parsley, salt, basil, garlic, basil, fennel, oregano, and pepper. Gently mix to combine using your hands. Oven-Baked Meatballs: Place a wire cooling rack on a baking sheet lined with aluminum foil and spray it with cooking spray. Arrange meatballs on top and bake at 400 degrees F for 15-20 minutes. Pan-Seared Meatballs: Heat about 1/4-inch of oil (I use half olive oil, half vegetable oil) in a large cast iron skillet. Brown meatballs in batches, cooking 2-3 minutes per side and turning with a spatula to create a nice crust around outside of each meatball. Transfer the partly cooked meatballs to a baking sheet lined with aluminum foil and bake at 300 degrees for 10 minutes until done OR set aside to add to the spaghetti sauce and simmer for 15-20 minutes in the sauce until meatballs are cooked through. Pan-Fried Meatballs: Heat an inch of oil over medium-high heat in a large cast iron skillet until it shimmers, then cook meatballs in batches for 3 minutes on one side, then carefully flip and cook another 2-3 minutes on the second side. Remove meatballs to a paper-towel lined plate and cook remaining meatballs. Pour off any oil left in the pan from searing or cooking the meatballs but don’t wipe out the fond (those browned bits on the bottom of the pan). Make the spaghetti sauce by sauteing onions in 1 tablespoon olive oil for a 3-4 minutes, then add garlic and cook 1 minute more. Add crushed tomatoes, sugar, basil, oregano, parsley, salt, crushed red pepper flakes, and black pepper and stir to combine. Add the partly cooked meatballs if using the second, pan-searing method mentioned above. Simmer for 15-20 minutes, until the sauce thickens slightly. While sauce simmers, cook the spaghetti according to package directions until just al dente. Drain well then toss with the meatballs and spaghetti sauce, or serve separately. Serve with freshly chopped parsley and Parmesan cheese for sprinkling on top. Recipe makes 12 large meatballs, 24 medium meatballs and 50 small meatballs. Cooking times will need to be adjusted if making smaller meatballs.